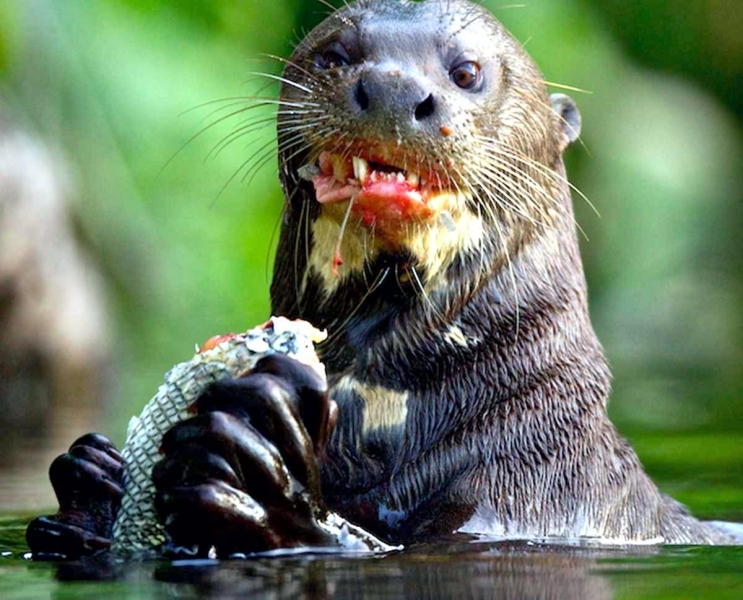 The Giant Otter is the largest member of the otter species and is found in the lakes, rivers, creeks & swamps of South America. 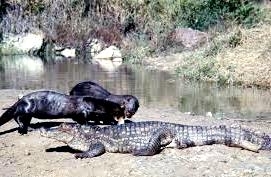 Adults can reach up to 6 feet in length and can weigh up to 76 pounds with males larger than females. 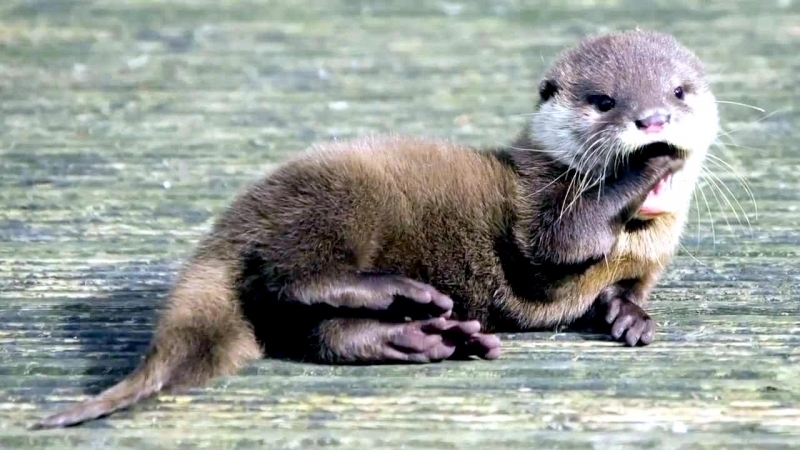 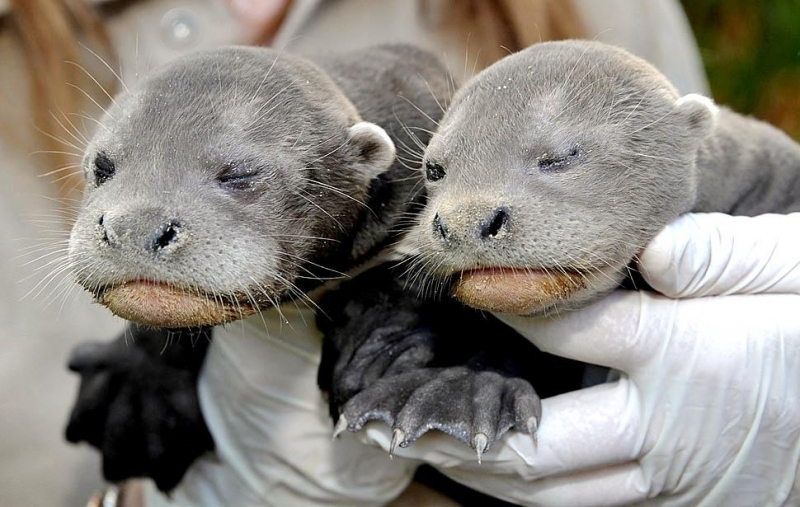 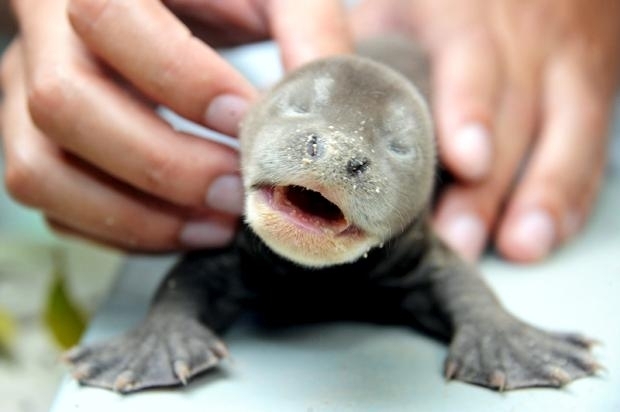 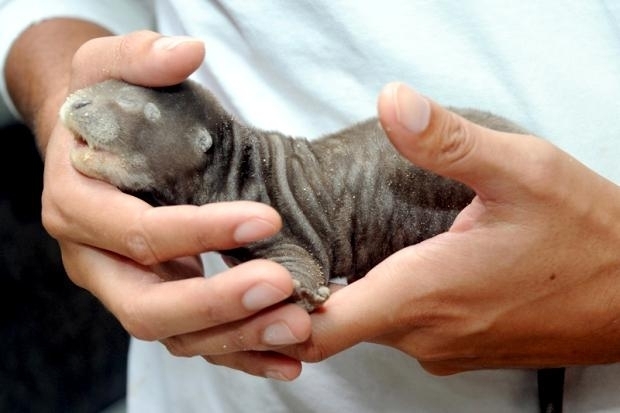 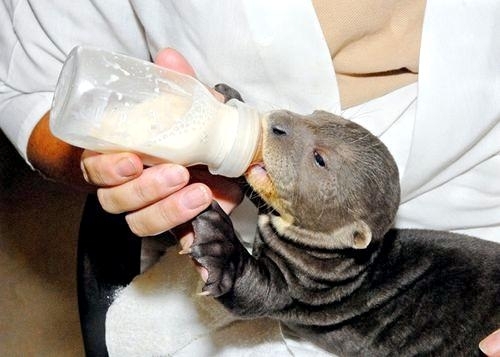 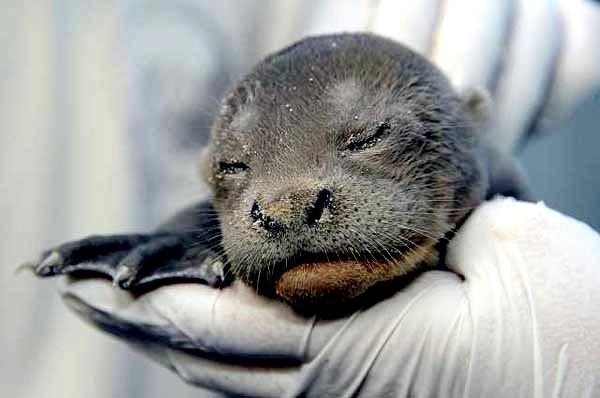 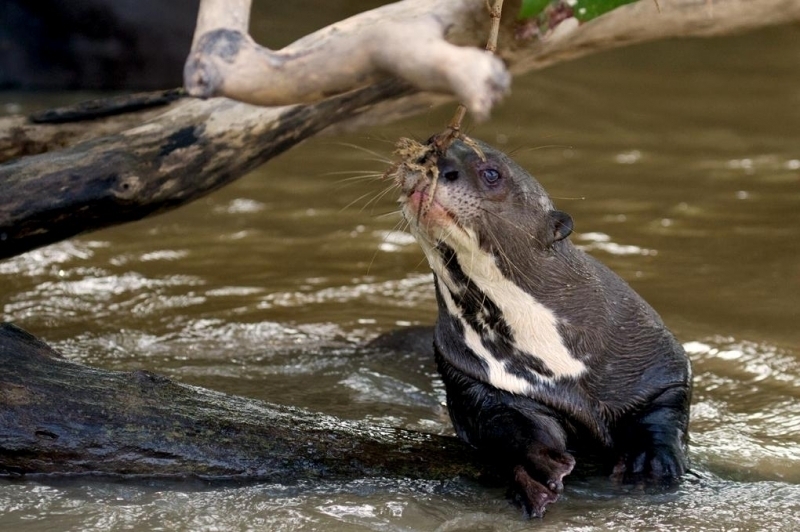 The Giant Otter has a handful of other names. 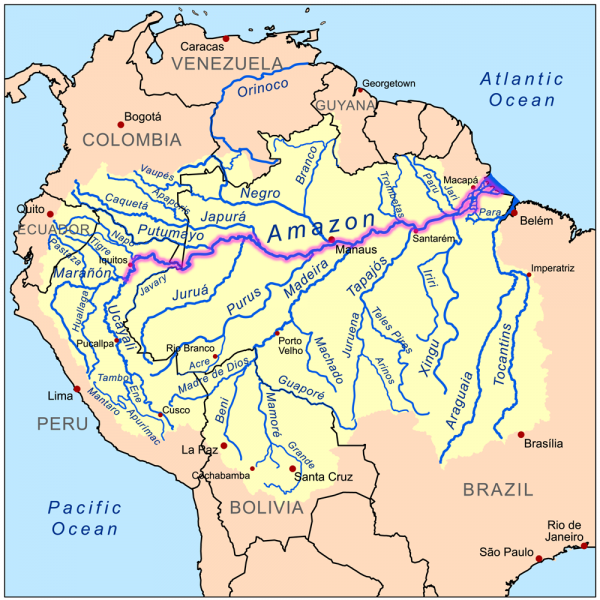 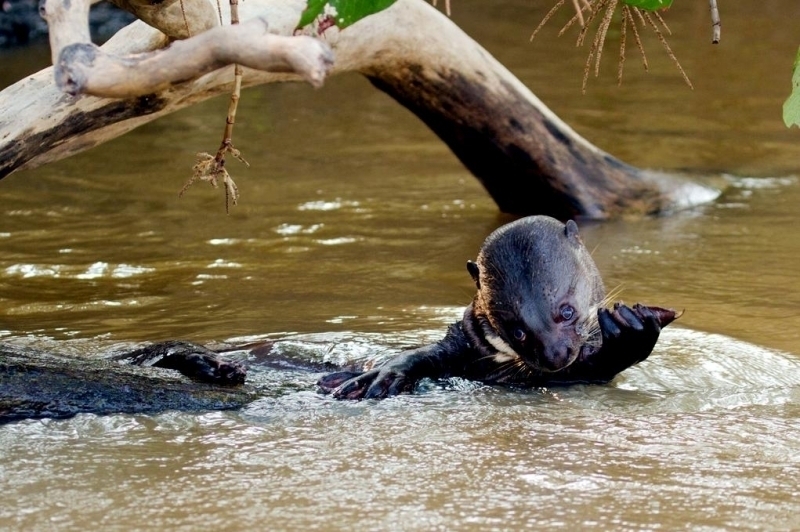 In Brazil, it is known as the Ariranha from the Tupi word ari’raña meaning Water Jaguar. 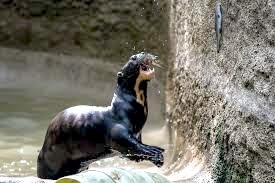 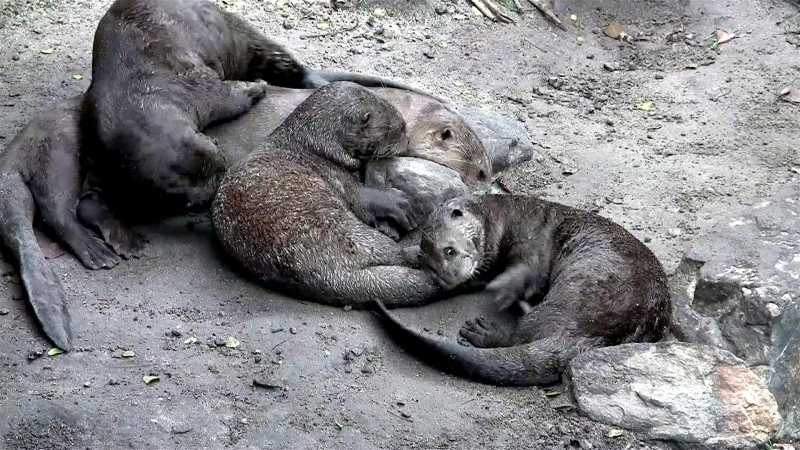 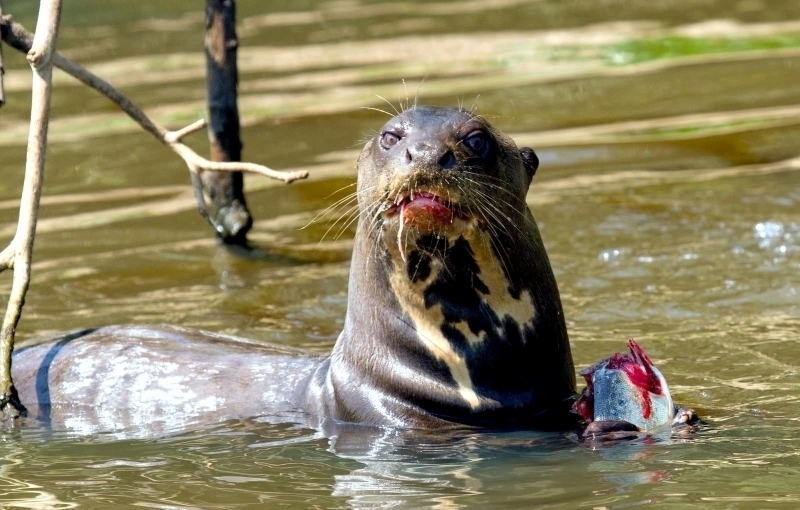 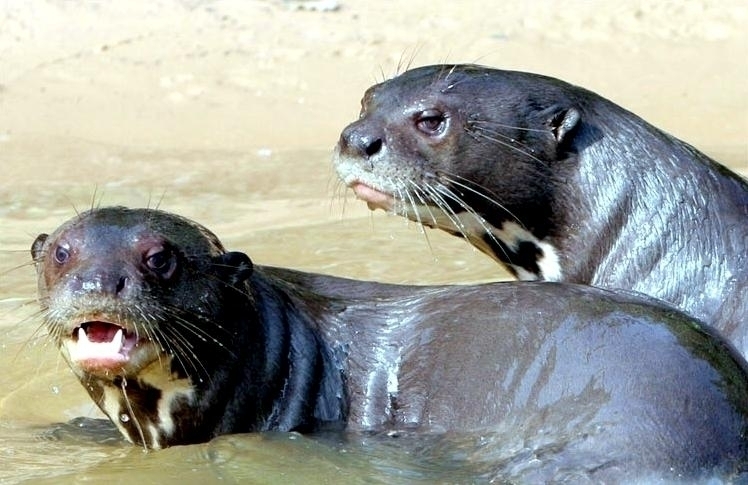 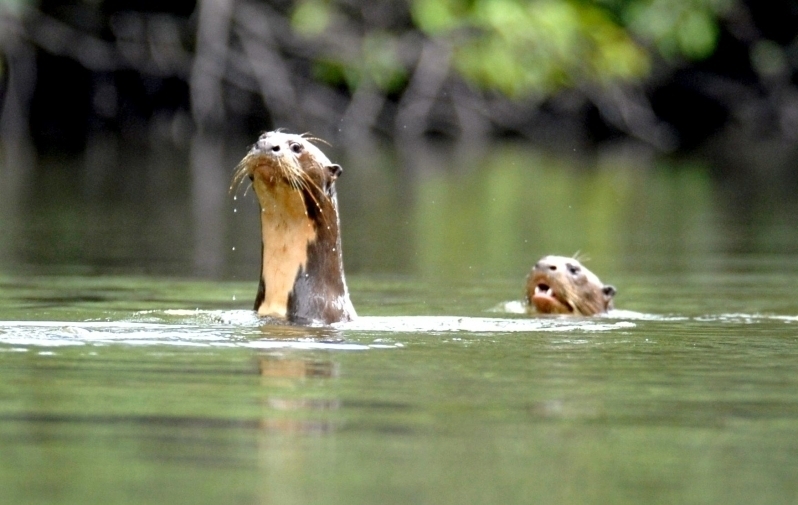 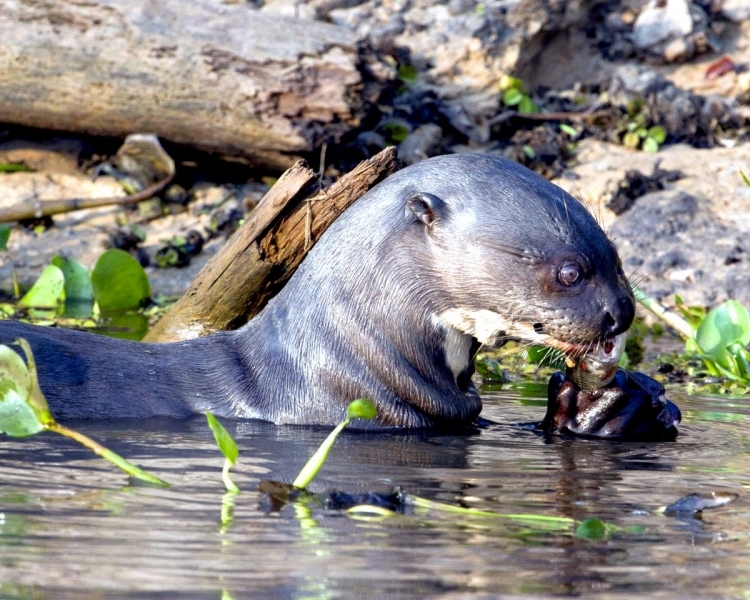 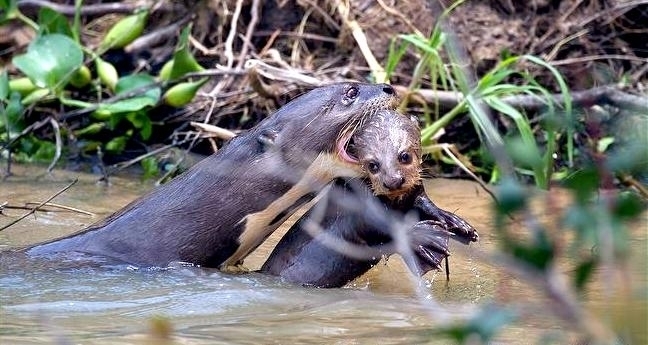 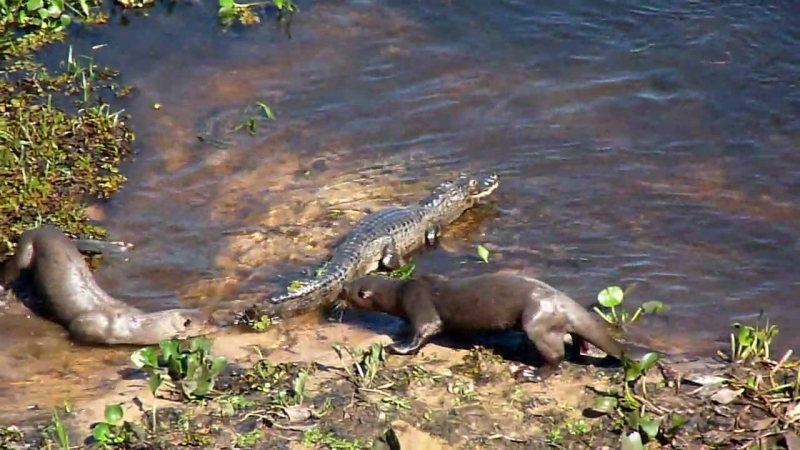 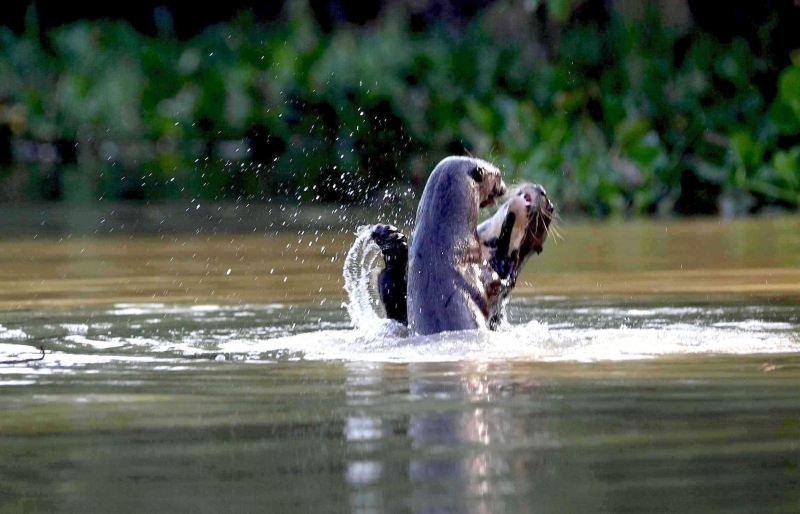 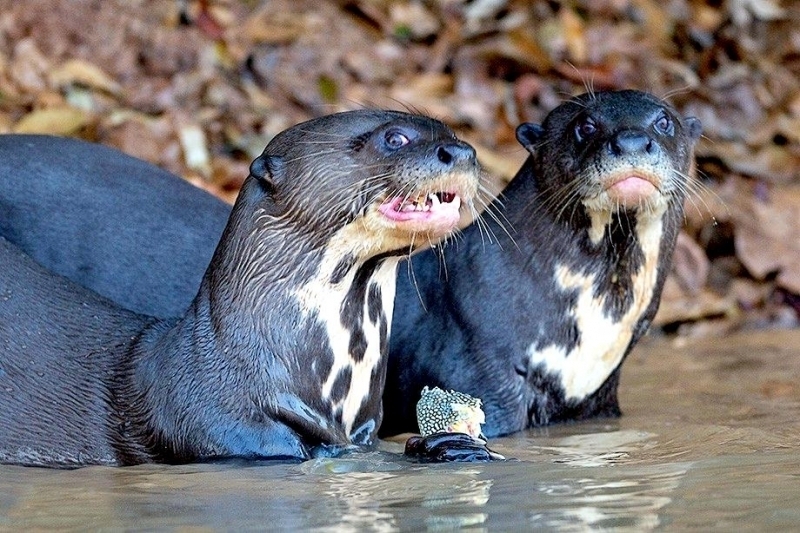 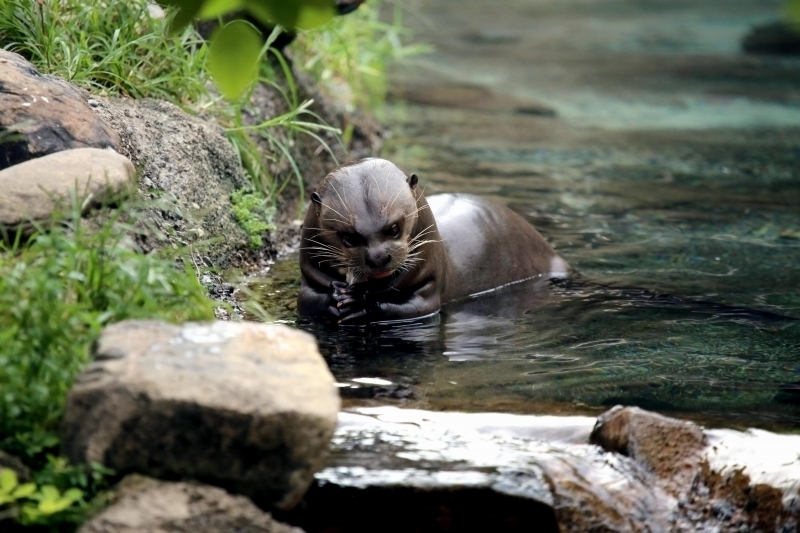 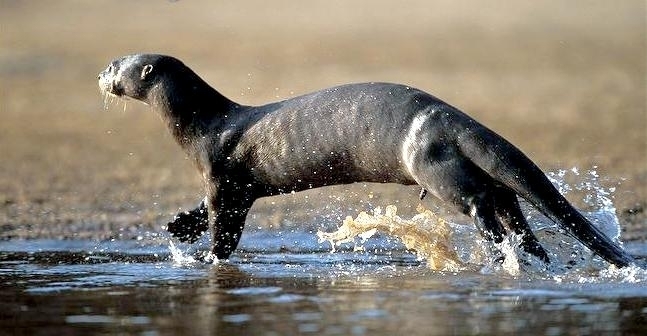 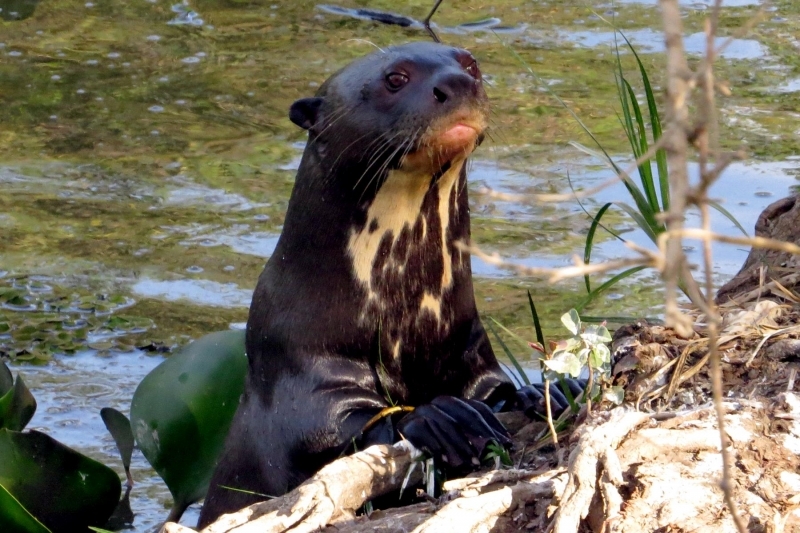 In Spanish, the Giant Otter is called the lobo de río meaning River Wolf and perro de agua meaning Water Dog. 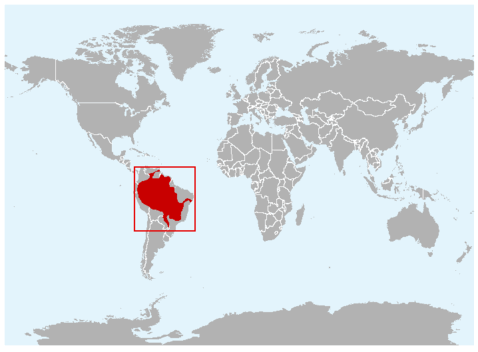 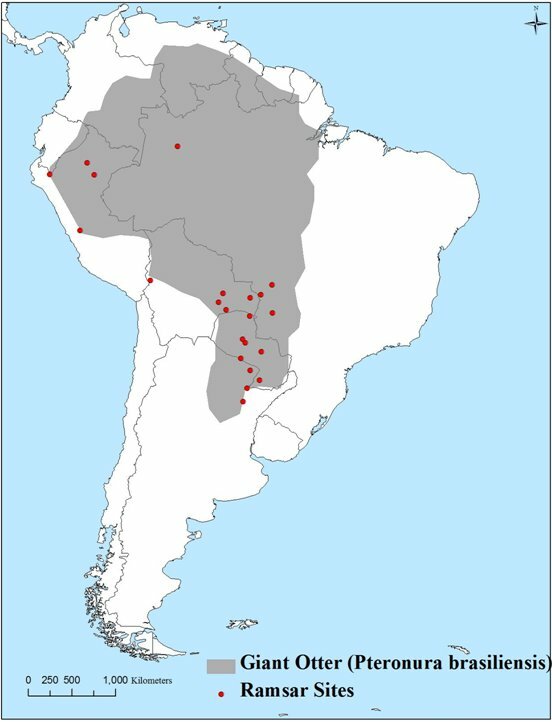 All three names are in use in South America with a number of regional variations. 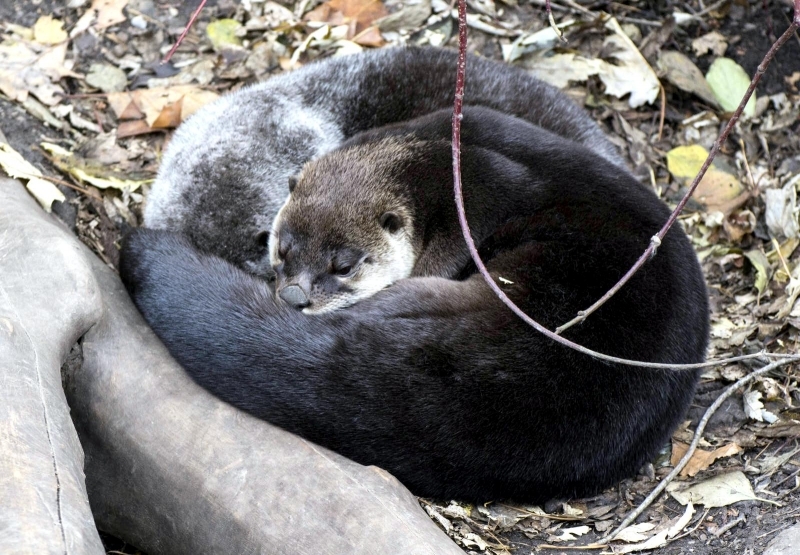 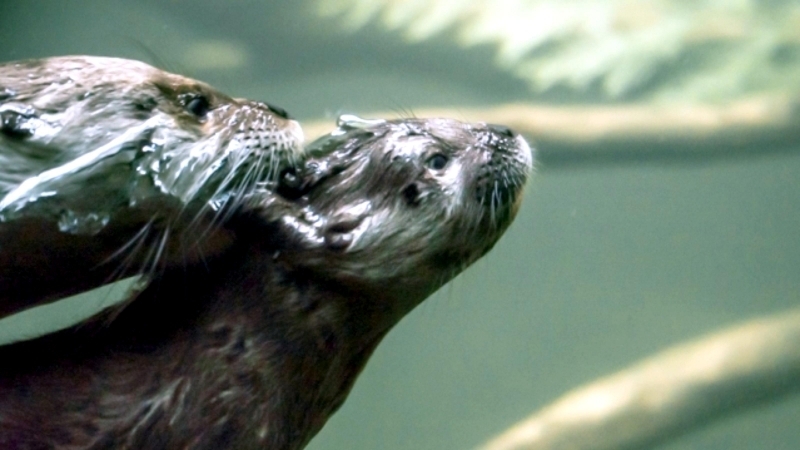 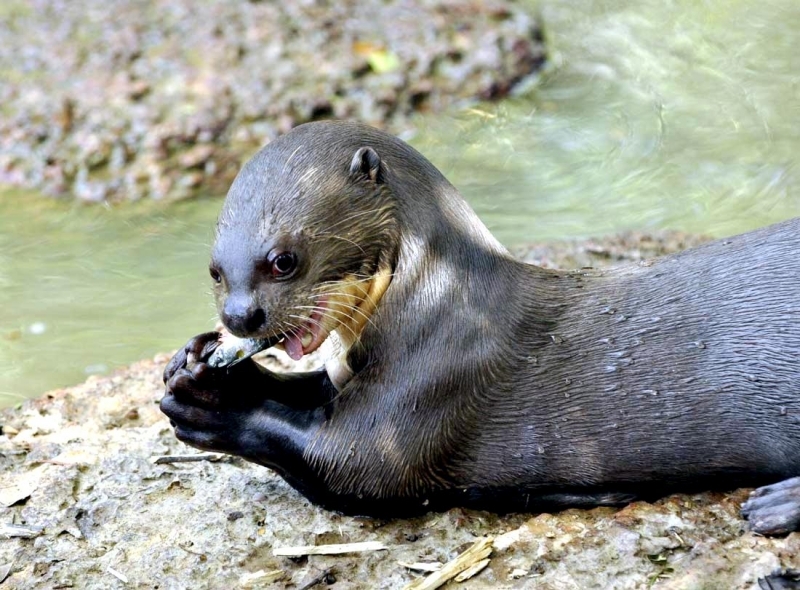 The Giant Otter’s fur is dense, thick, velvety and brown in color. 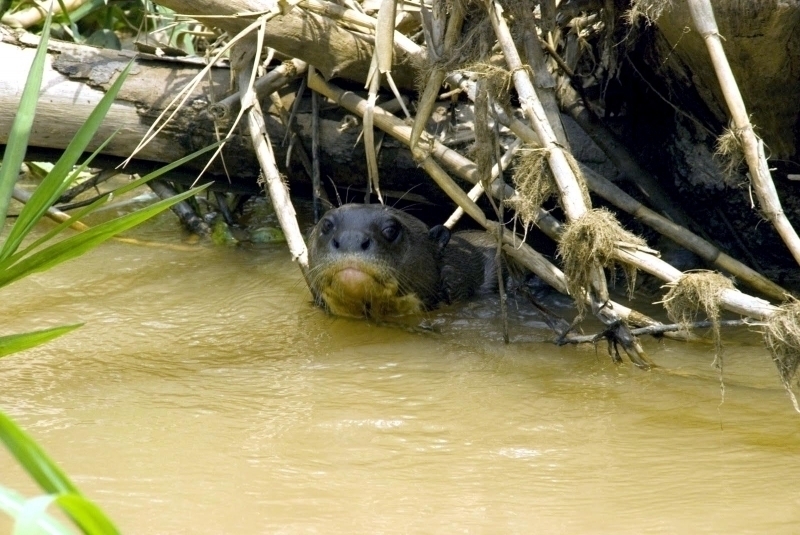 Its head is round, has small ears and there is a unique white mark located on its throat that can be used to distinguish between individuals. 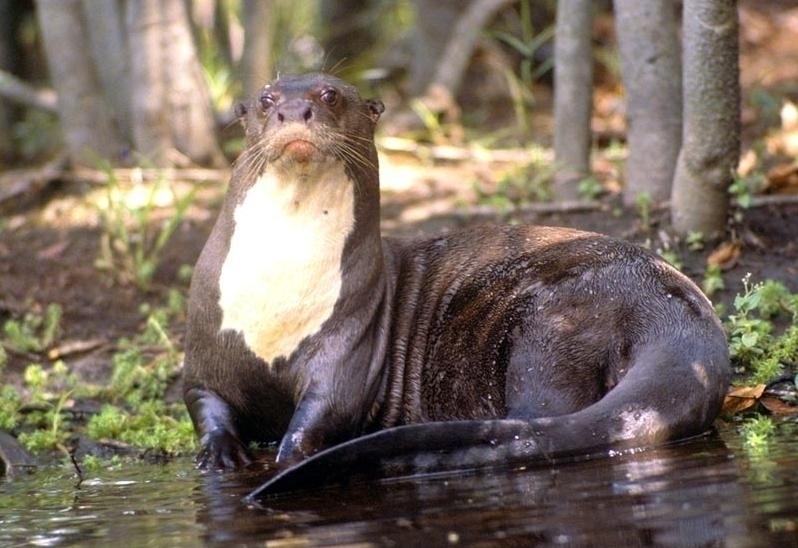 Its nose is completely covered in fur with only the 2 slit-like nostrils visible. 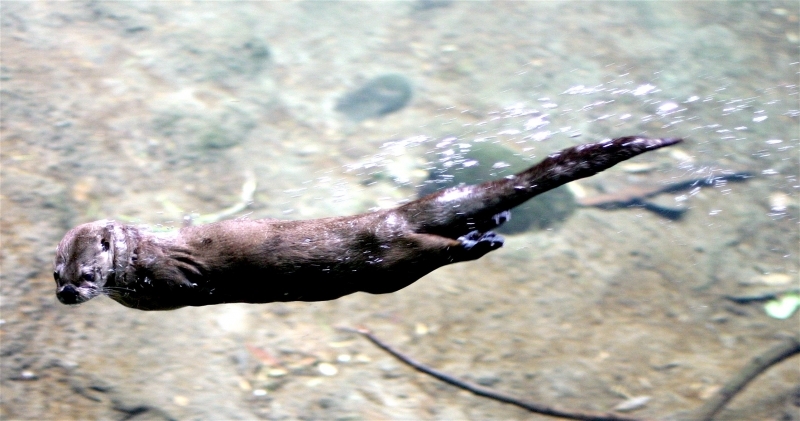 Giant Otters are excellent hunters underwater possessing large & acute eyes and they can also close their ears while underwater. 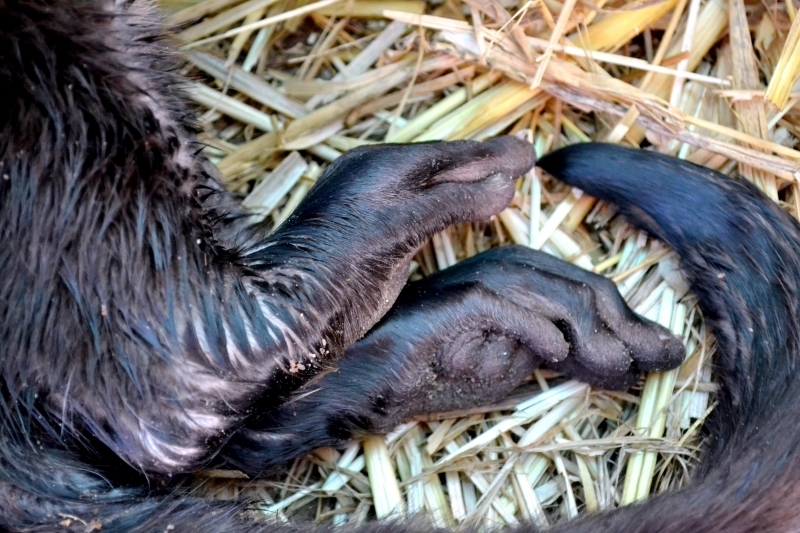 The legs are short & stubby and its feet are equipped with webs & sharp claws. 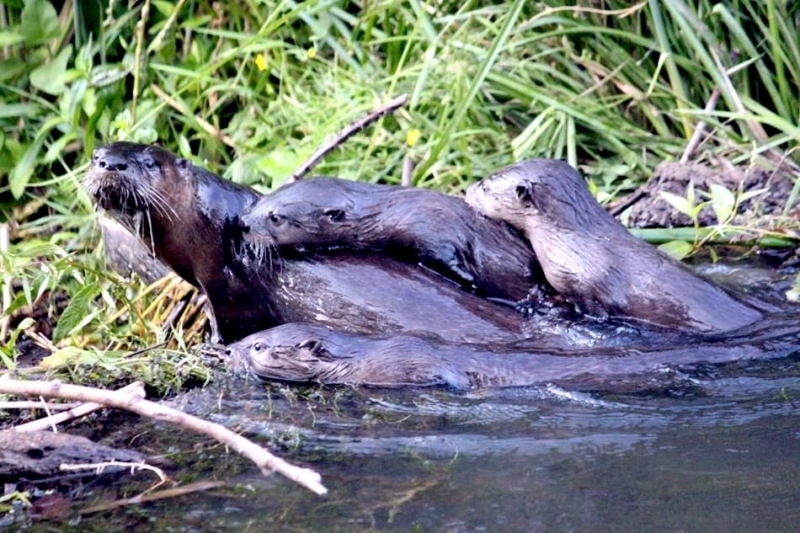 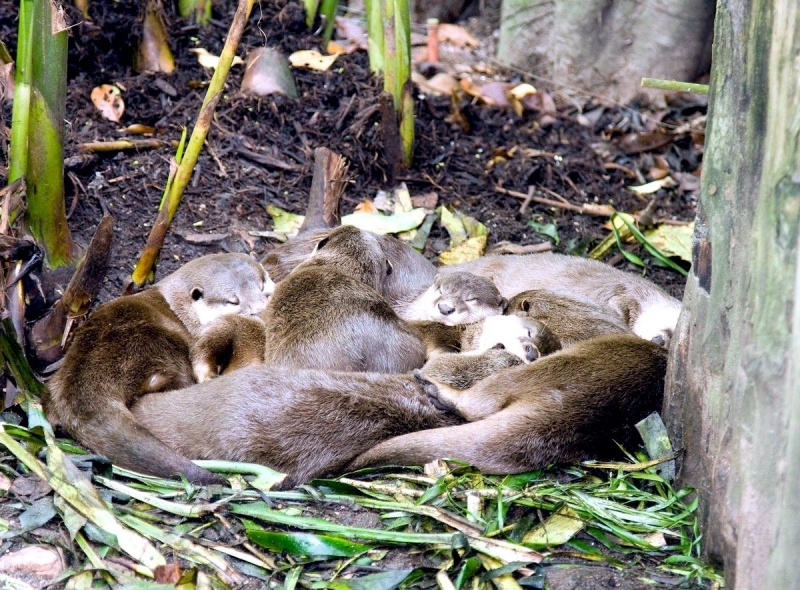 Giant Otters are very social animals and groups of up to 20 individuals have been found in forms of “family groups”. 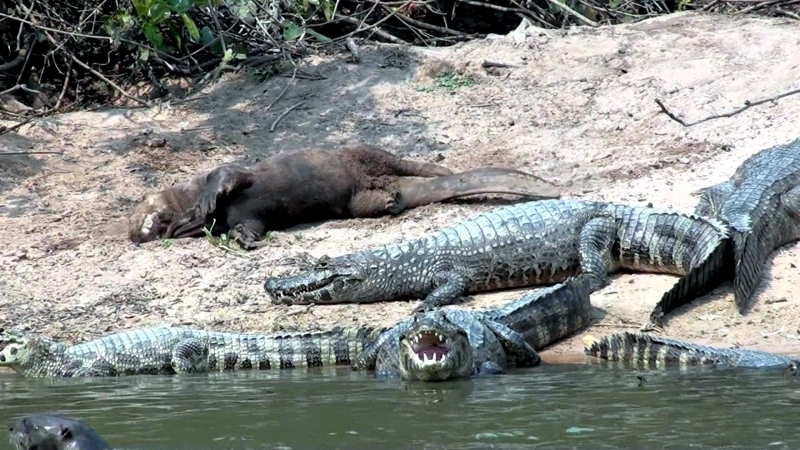 Each individual in the groups has a role and there is only 1 main breeding pair. 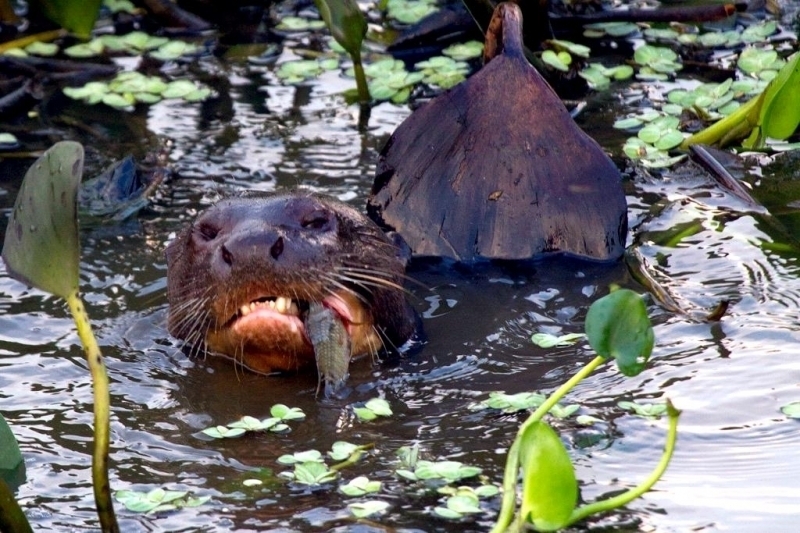 Diet consists mainly of fish, crabs, snakes and even Black Caimans. 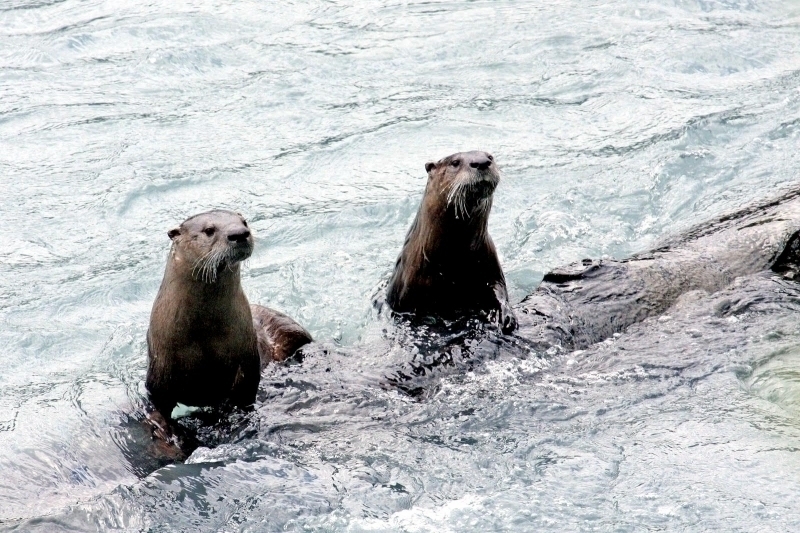 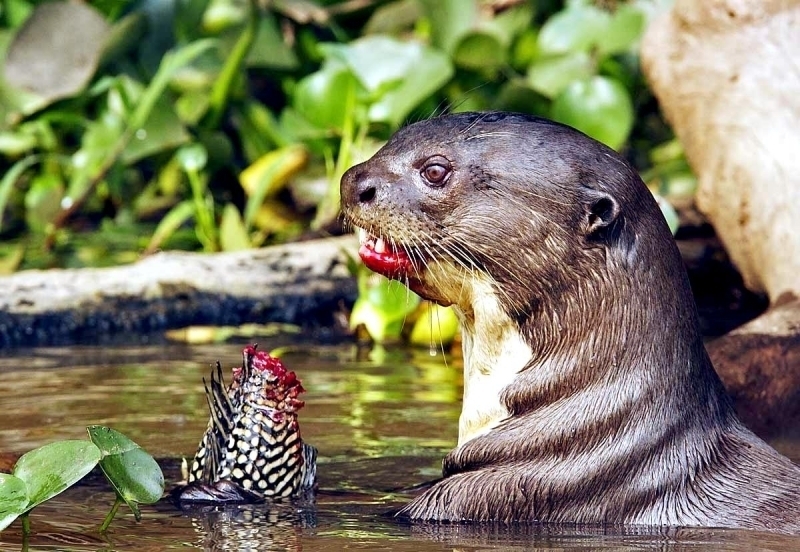 Giant Otters can consume up to 10 pounds of food a day. 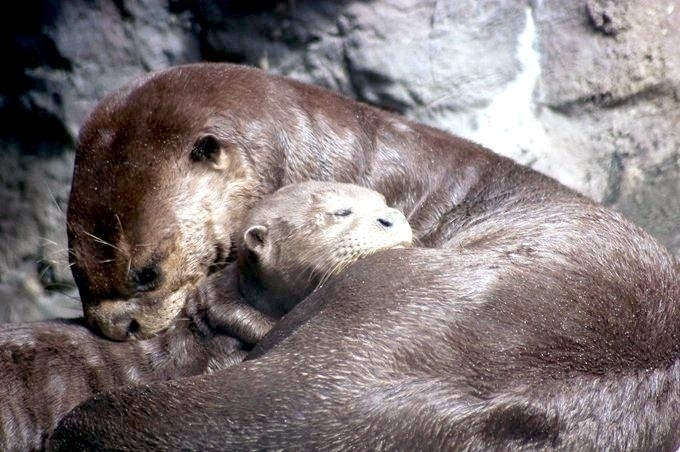 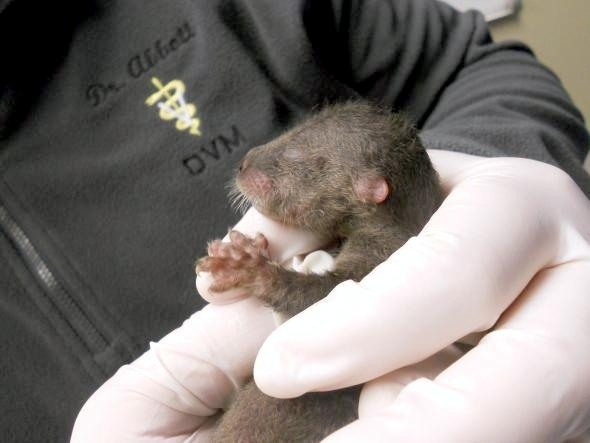 Breeding occurs year-round and females give birth to litters of 1 to 5 pups after a gestation period of 65 to 70 days. 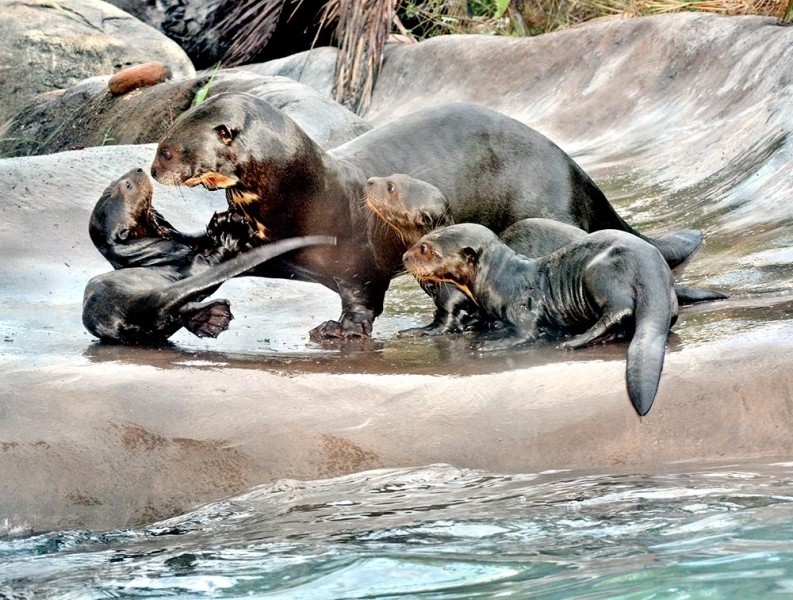 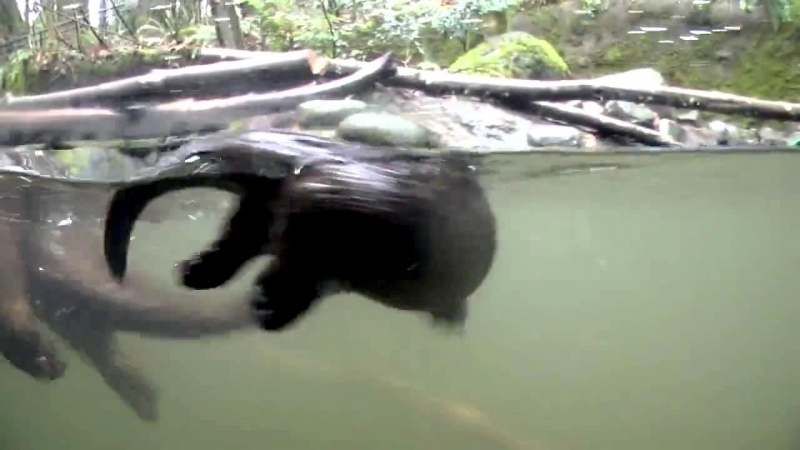 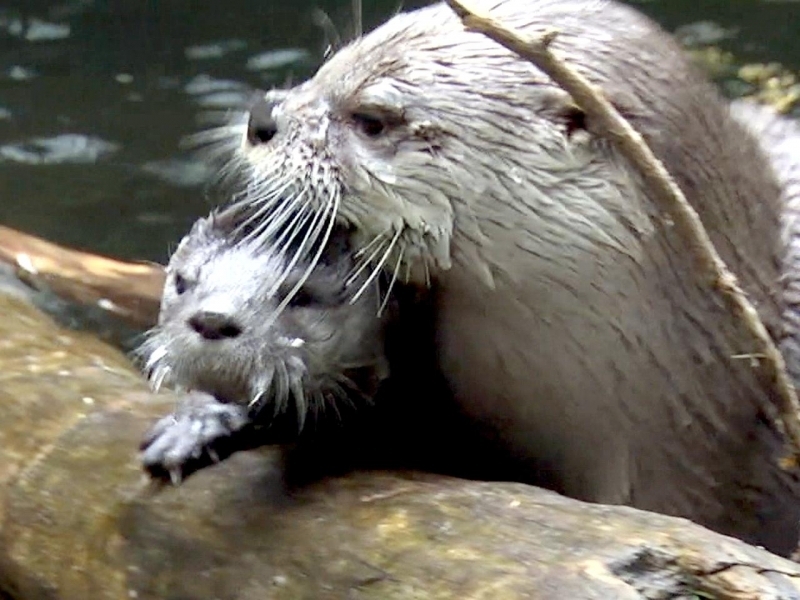 The pups are taught to swim after 2 months but remain dependent on the mother for 2 to 3 years. 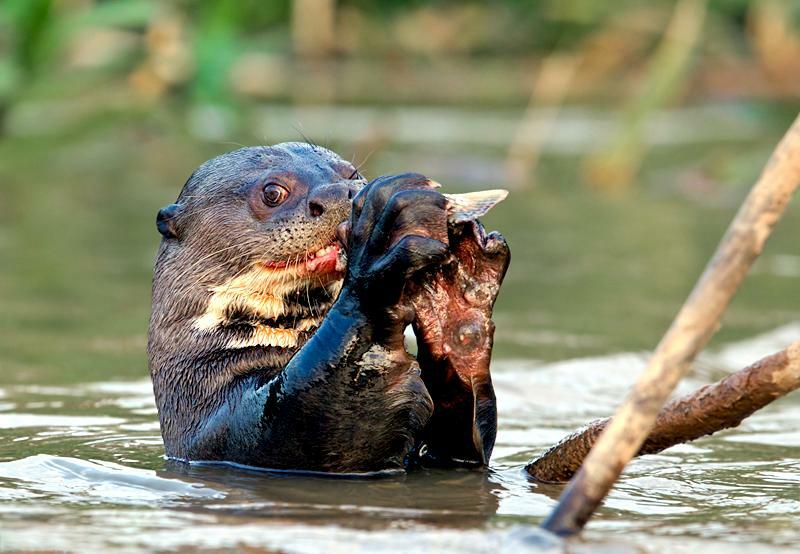 Today, there are only about 5,000 Giant Otters left in the wild. 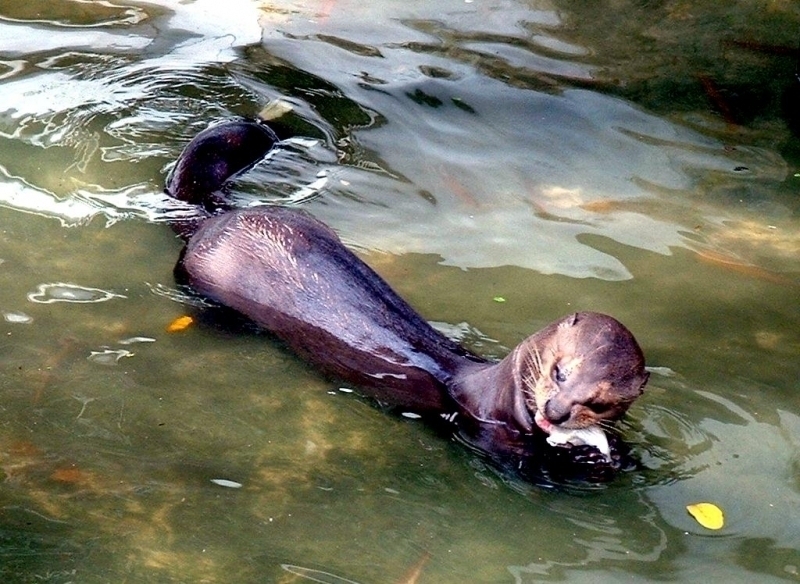 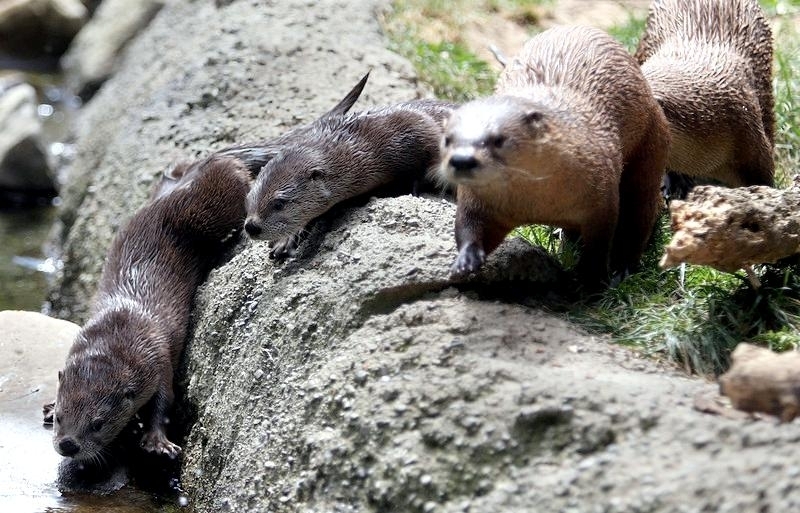 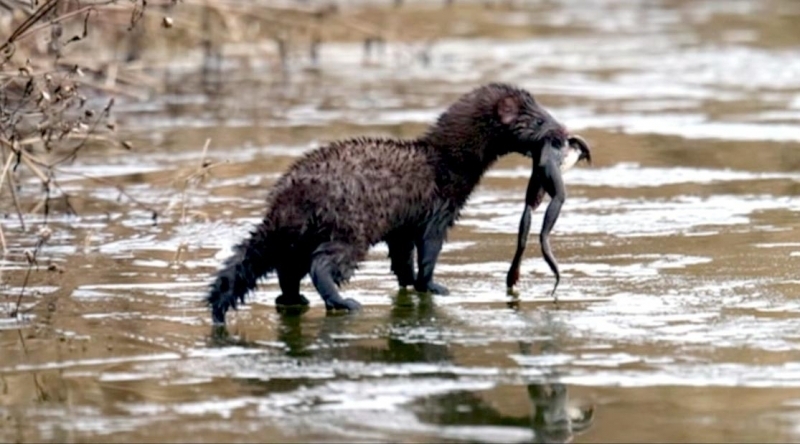 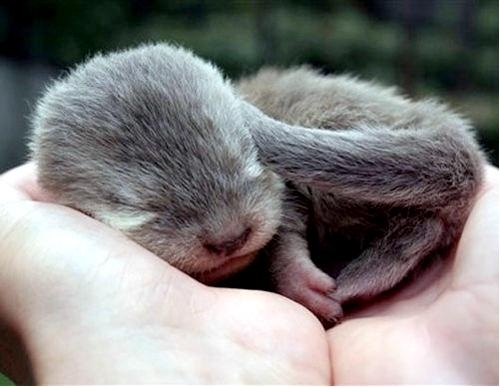 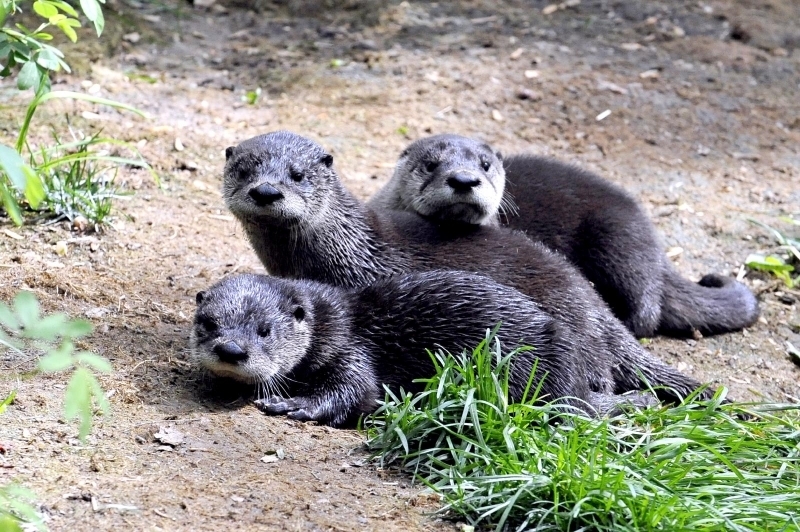 The main cause of decline is hunting of the Giant Otter for its fur. 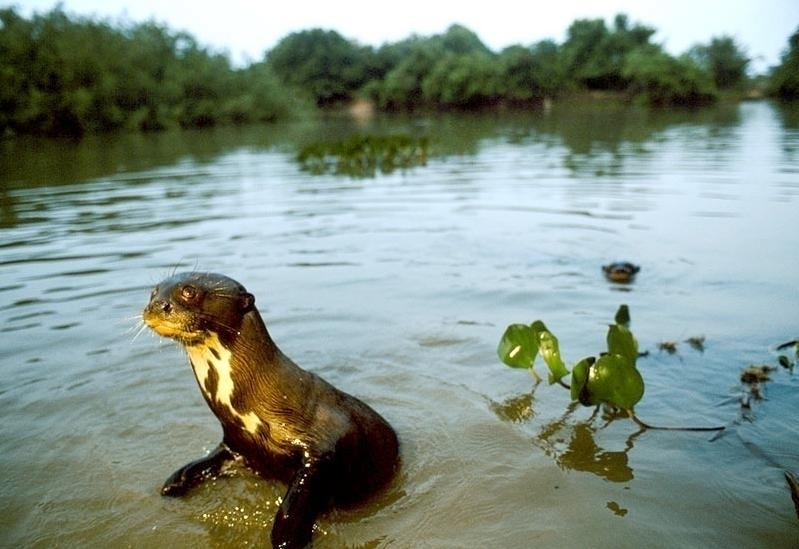 Its thick velvety fur was once worth a year’s wages in South America driving them to near extinction in the 1970’s. 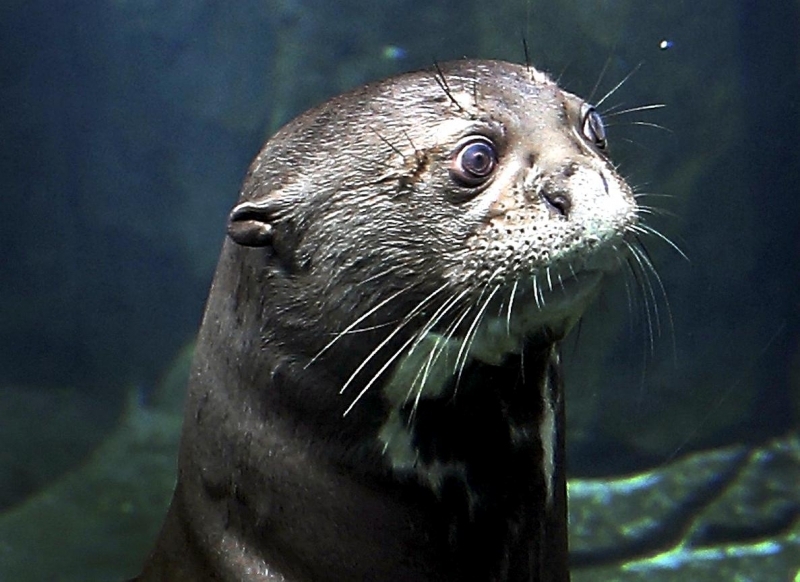 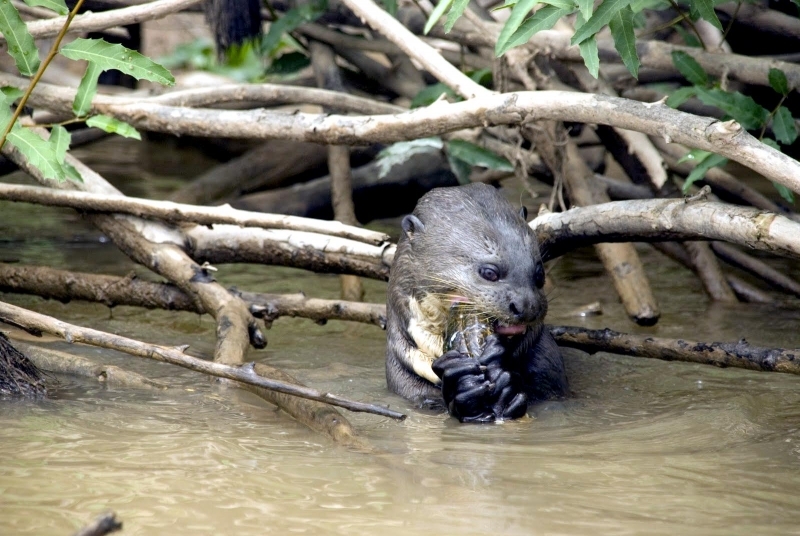 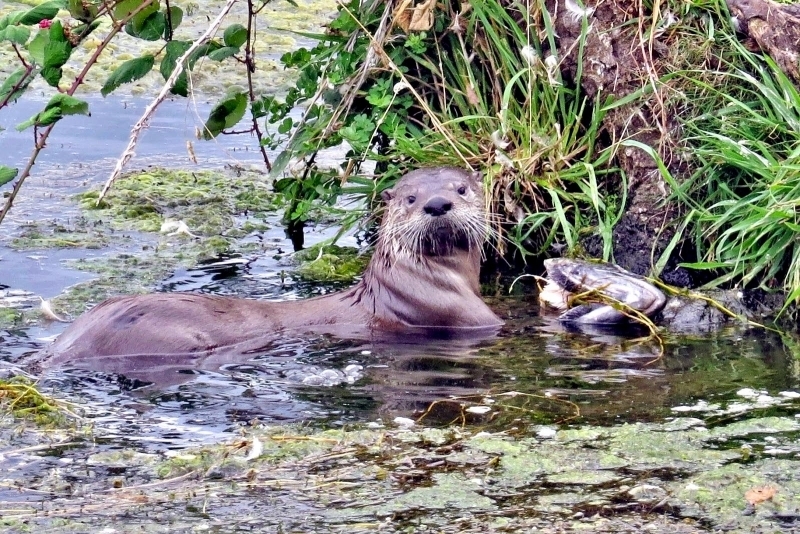 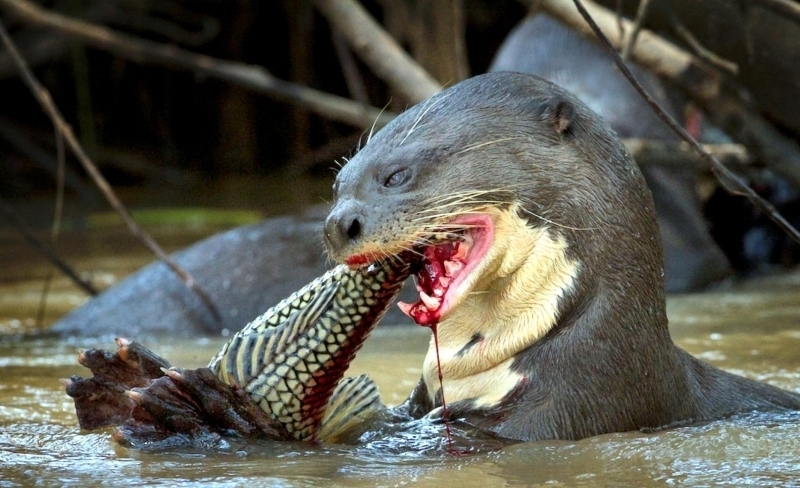 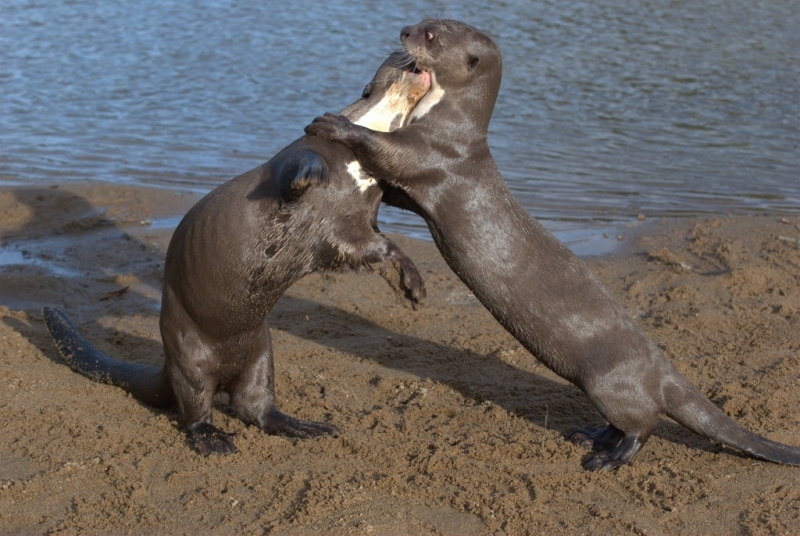 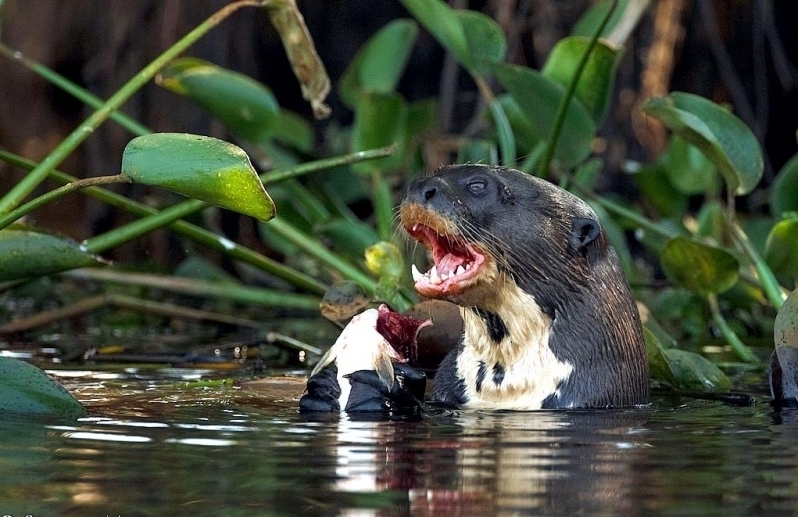 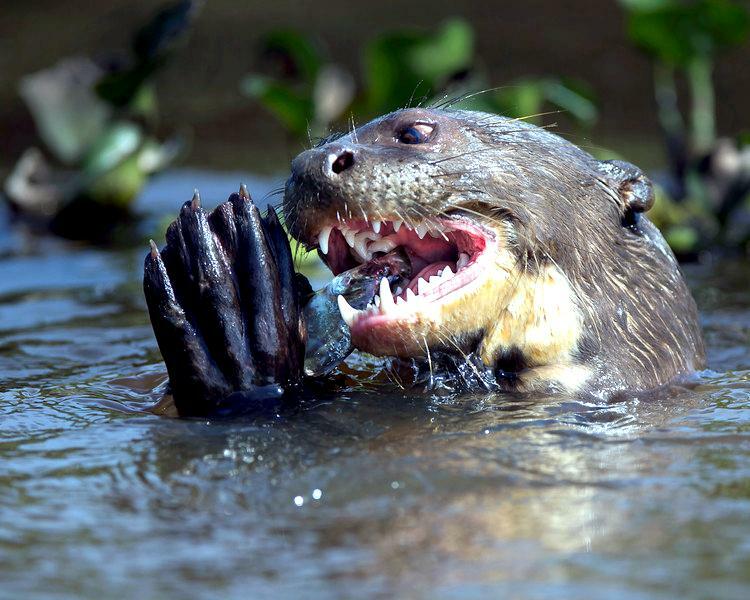 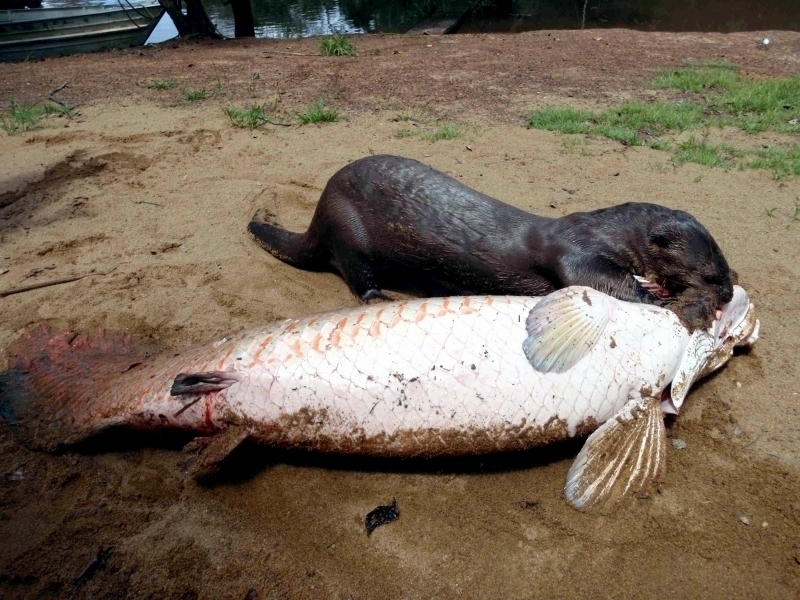 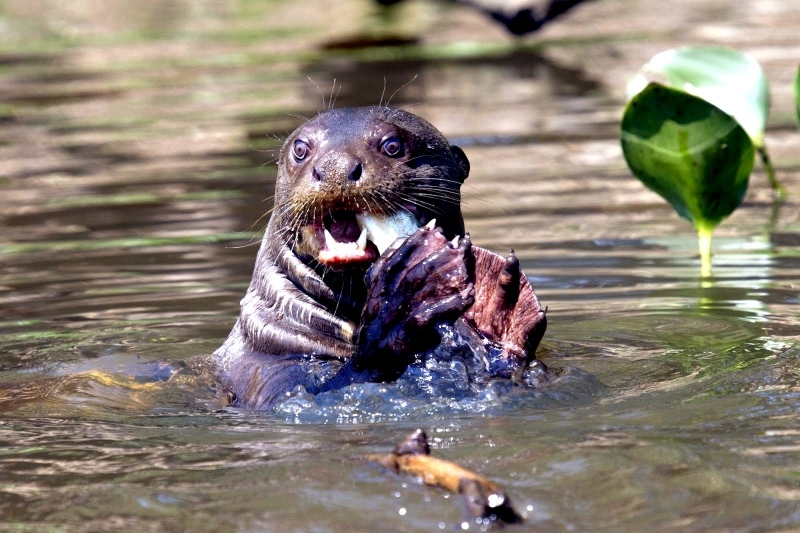 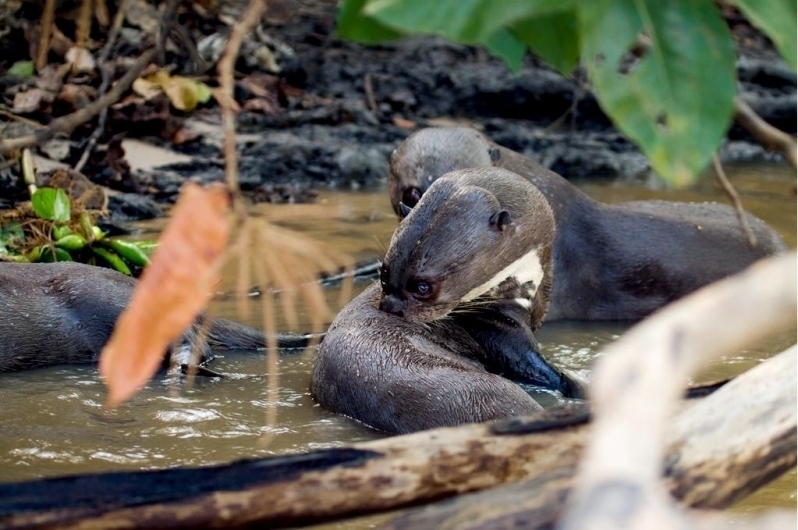 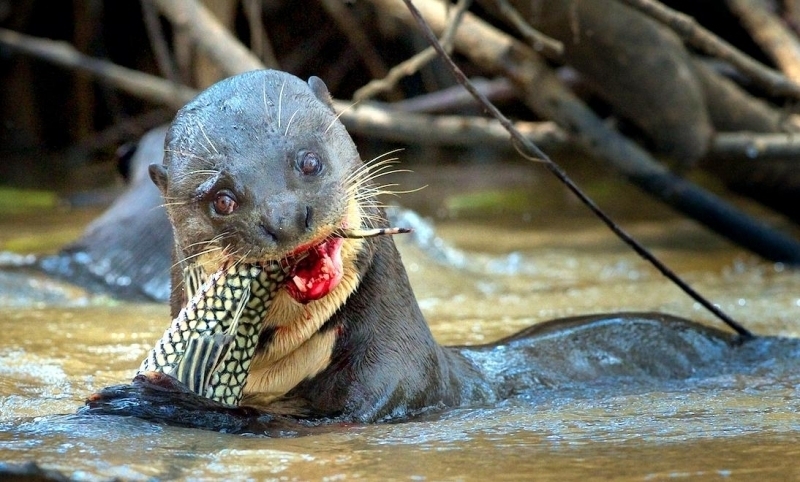 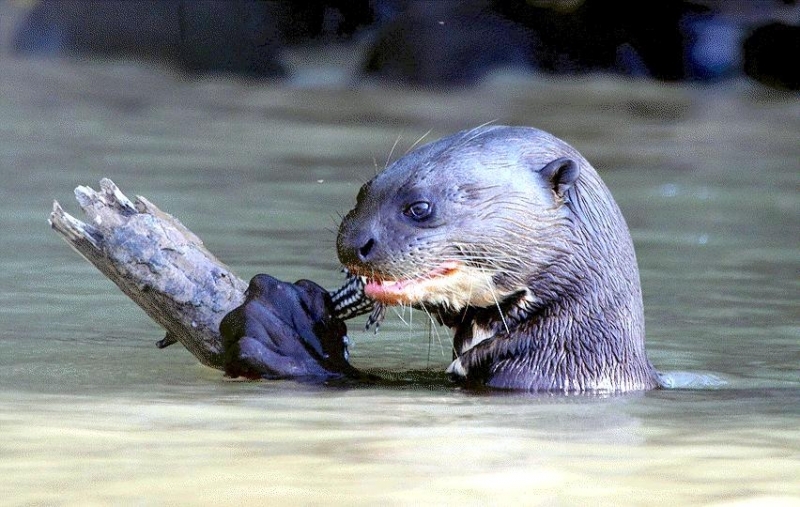 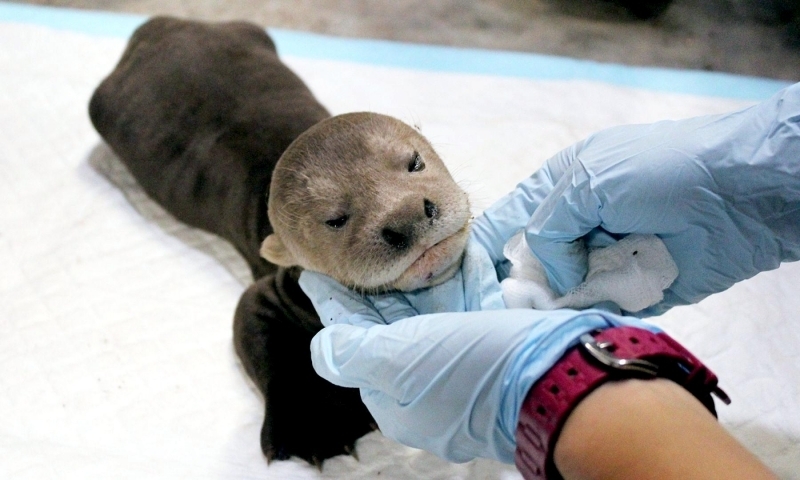 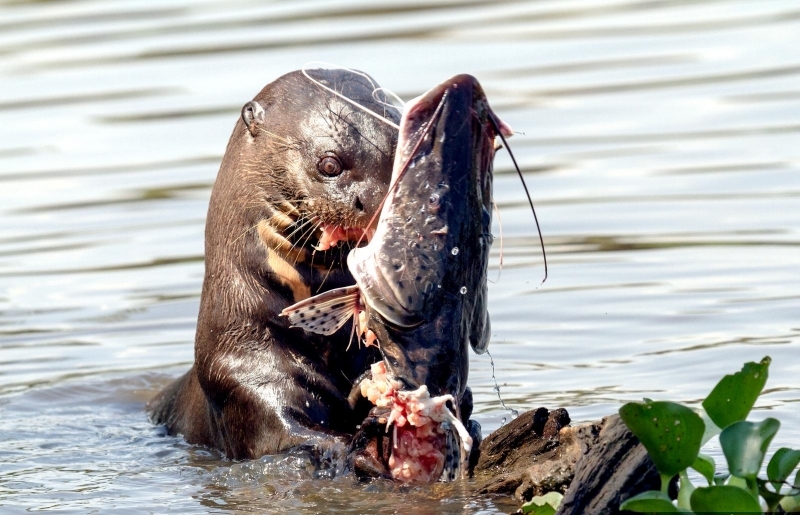 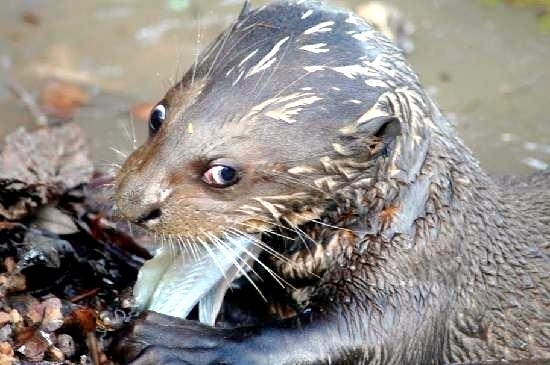 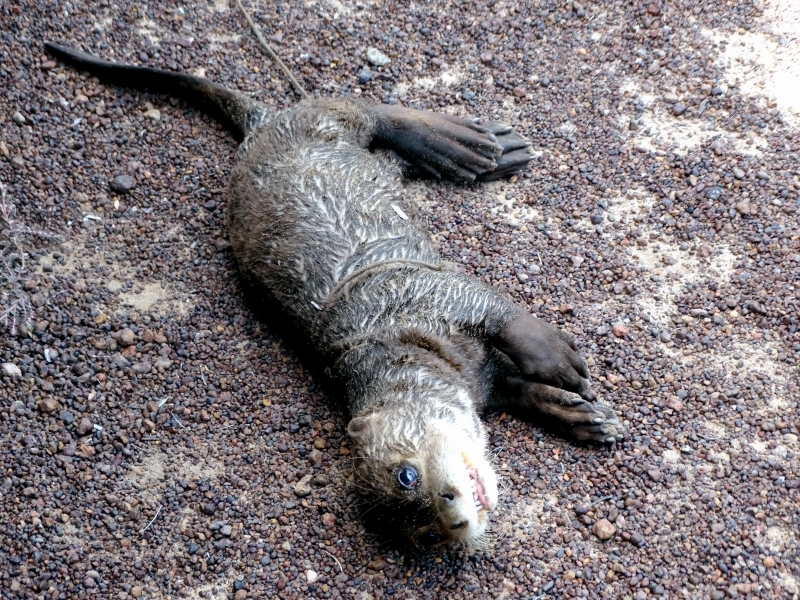 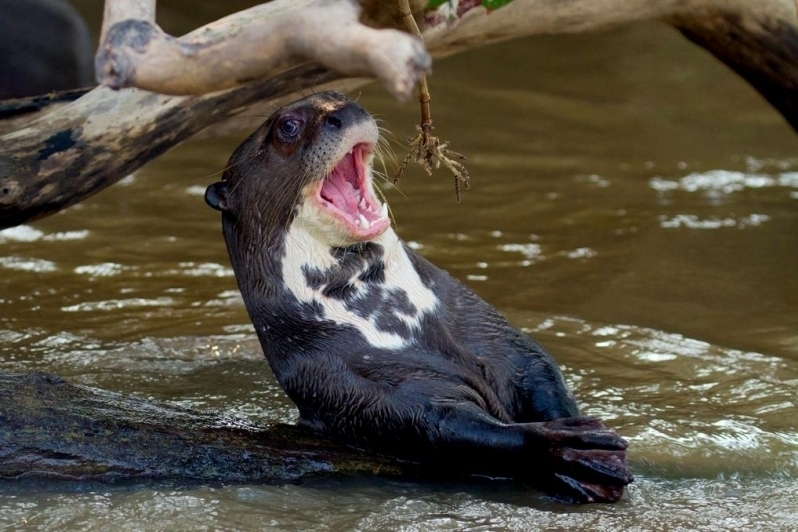 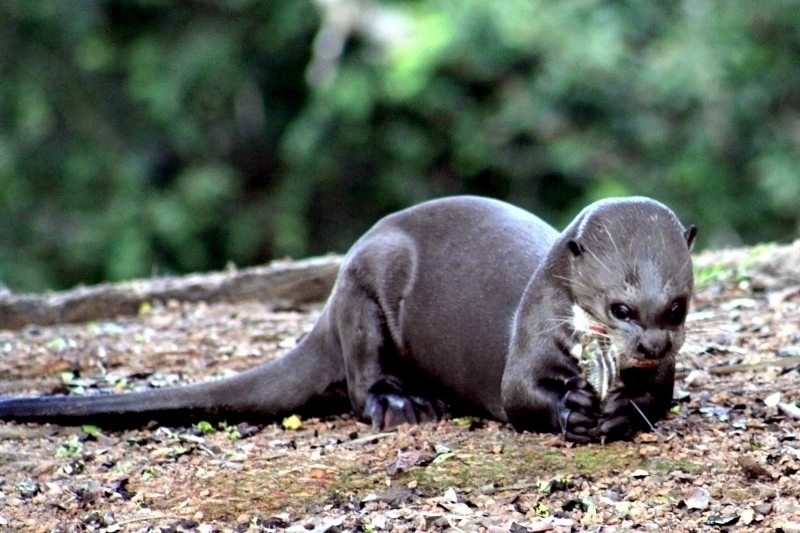 The Giant Otter is also shot by fishermen who consider them competitors for fish. 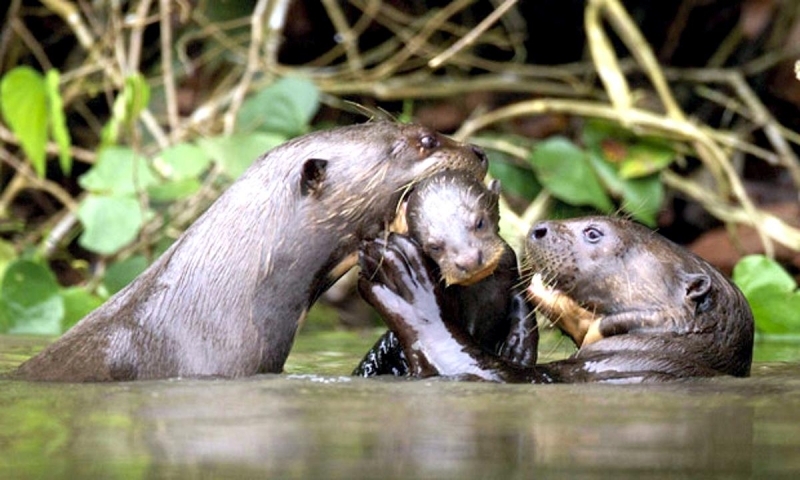 Habitat loss & disturbance of their natural habitat is also a threat. 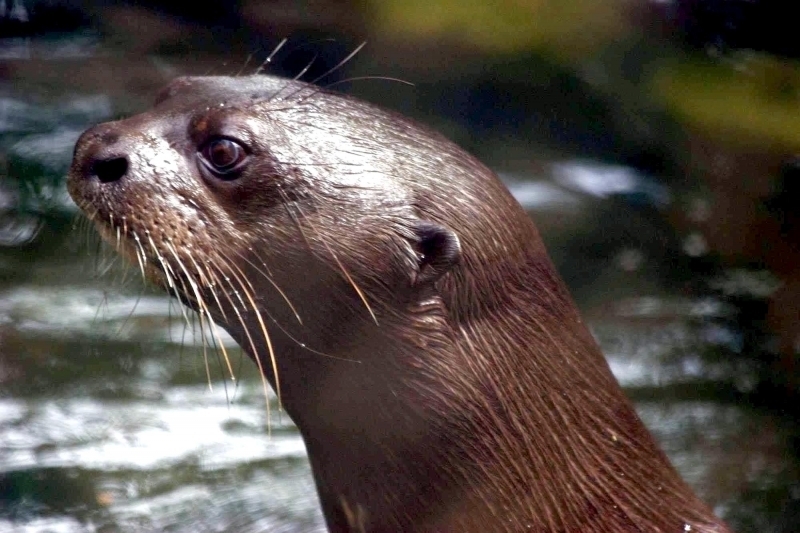 All pelt trade has been banned to help protect the species.